Prentiss Hubb entered Saturday’s game in a much talked about shooting slump. The freshman point guard was just 11-for-68 from the field in the last nine games and head coach Mike Brey was set to bring him off the bench after starting 12 of 15 games this season. 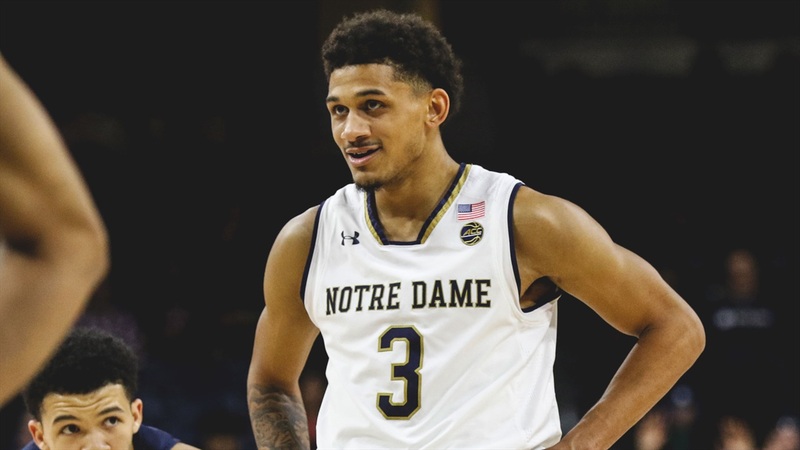 The plan quickly changed when starting guard TJ Gibbs became ill during warmups leaving Notre Dame with a rotation of just six players and Hubb found himself back in the starting lineup. The 6-foot-3 Maryland native quickly made his presence felt as he hit a trey on the game’s first possession on his way to scoring a career-high 16 points in Notre Dame’s 69-66 win over Boston College. Hubb not only scored but he hit two free throws to give the Irish a one-point lead with just over two seconds to play in the game. Brey never doubted his young point guard as Hubb’s numbers in practice reflected a slump instead of a player unable to shoot the basketball. “Through 55 practices, he’s shot 38% from the three-point line,” Brey explained. “Guys who can’t shoot, it will play out over 55 practices. I also know what he did for us here is what he did for us early by scoring in the first half to help us. Despite his struggles from the field, Hubb remained positive and trusted in Brey’s message to him that it would come back around to him. Hubb stayed ready and took advantage of the opportunity. Hubb also admitted it felt good to see his first shot of the game go down. Captain John Mooney was also fired up for the freshman as he knows how important it is to get Hubb confident, especially with an even smaller rotation. “P-Hubb was killing it,” said Mooney. “He made those big-time free throws.